April 15, 2015: The Arts Fund is pleased to announce the opening of IMPART: An exhibition for the 2015 Teen Arts Mentorship Master Artists on Friday, May 1, 2015. The exhibition will feature the work of this year’s outstanding cast of professional artists and writers who have graciously accepted the opportunity to impart their knowledge to Santa Barbara’s next generation of artists. As a reflection of the mentorship program itself, this exhibition will feature a diverse array of media including alternative process photography, old masters oil painting, plein air painting, creative writing, stainless steel sculpture, drawing and mix-media; all art forms taught in this year’s spring and summer mentorships. The exhibition also serves as a precursor to the Spring 2015 Teen Arts Mentorship Group Exhibition opening on June 26th. 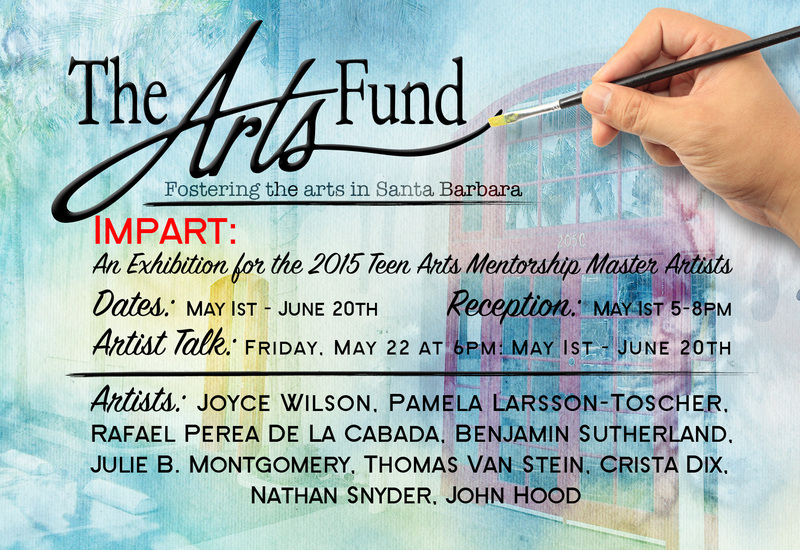 The exhibition will be held at The Arts Fund Gallery, located at 205-C Santa Barbara Street, and will be on view until June 20, 2015. A public reception will be held in the gallery on the evening of Friday, May 1st from 5-8pm as part of the Funk Zone Art Walk. There will also be an artist talk held on Friday, May 22nd at 6pm as a chance to meet and speak with the artists about their work. Regular gallery hours are Wednesday-Friday from 12-5pm, Saturday from 11-5pm and Sunday from 11-4pm. The exhibition is free and open to the public. 2015’s spring and summer mentorship classes include Alternative Process Photography with Joyce Wilson, Old Masters Painting with Pamela Larsson-Toscher, Stainless Steel Sculpture with Nathan Snyder, Storytelling: The Mechanics of Creative Writing with Benjamin Sutherland, Historic Plein Air Painting with Thomas Van Stein, Gallery and Curatorial Studies with Crista Dix, Public Murals with John Hood, Drawing: Creating a Series with Rafael Perea De La Cabada, and Draw to Explore: Journaling and the Artistic Process with Julie B. Montgomery. About the Teen Arts Mentorship program: For over 20 years, this unique arts enrichment program has offered promising teenage artists the opportunity to work closely with local professional master artists in a studio environment. Working in small groups of no more than 10, students receive specialized training, produce portfolio-quality work, gain insight into future careers in creative fields, and participate in a group exhibition in a professional gallery. The Teen Arts Mentorship Group Exhibition represents the culmination of students’ work in this program by introducing them to the process of preparing and displaying art in a public venue. The Teen Arts Mentorship Program is made possible by the generosity of the Morris B. Squire Foundation, the Santa Barbara Foundation, the Ann Jackson Family Foundation, Claudia and David Chapman, Change Happens Foundation, Gracie Charitable Foundation, Towbes Foundation, Ove W. Jorgensen Foundation, Looker Foundation, Wood-Claeyssens Foundation, Daniel and Dianne Vapnek, Richard and Maryan Schall, and Bob and Christine Emmons. For more information on the Teen Arts Mentorship Program, other Arts Fund programs and how to support, please call The Arts Fund at (805) 965-7321 or send an email to info@artsfundsb.org. Gallery sales and private donations are an important and essential source of funding for the organization. Please visit http://www.artsfundsb.org to learn about upcoming programs and events or to make a donation to support The Arts Fund. The Gallery is open Wednesday through Friday, 12-5pm, Saturdays 11-5pm, and Sundays 11-4pm. CLOSED MONDAY & TUESDAY.